This installment of the Bite Me-series clocks in at 17 pages, 1 page front cover, 1 page editorial, 1 page ToC, 2 pages of SRD, 1 page advertisement, leaving us with 11 pages of content, so let’s take a look! The first archetype herein would be the Lycanthologist alchemist, who chooses one type of animal – said type becomes available for a kind of empathy that allows for better handling (i.e. “raptors”) and at 3rd level, the mutagen of this archetype allows for kind-of-lycanthropic shapes and some minor alter self-bonus scavenging instead of swift alchemy, with subsequent levels allowing for mutagens that also allow for beast shape-like benefits alongside some minor lycanthrope-themed benefits. Feral Ragers replace their defensive tricks with DR/silver equal to 1/2 Barbarian level -which may not sound like much, but he also gets + class level extra rage rounds – upon first entering them, though, the feral rager becomes confused on a failed will-save, rendering this a dangerous proposition. The Soother of the Savage bard gets a modified spell-list and is themed around emotional control – whether it is according to calm allies and prevent hostilities or incite them, with lycanthropes or raging creatures being particularly susceptible. The wild rider cavalier can instill barbarian-like rage in his mount and even share natural attacks with the mount, with higher levels further increase these powers – rather interesting one here! Moon Templar clerics must choose the lunar subdomain and 1/day during a full moon, may freely augment domain spells via metamagic. Alas, I’m not sold on the ability to channel energy at +50% efficiency for lycanthropes, with free selective channeling for the purpose of lycanthropes – whether as hunters or in all-lycanthrope-parties, I’m not sold on the massive damage-increase this freely provides for some of the most powerful 1st level abilities out there. The Lycanthropic Soul Druid receives beast shape added to the spell-list and may cast them spontaneously; DR and summoning lycanthropes are also provided. Fighters may opt for the Master of Tooth, Nail and Sword for a better manufactured weapon + natural weapon-synergy -less penalties, full Str-mod, etc. – while not something flashy, it does the job well. The Avenging Gun Gunslinger gets favored enemy and two deeds – one for better atk versus foes that have damaged him and one to bypass DR – this one is pretty bland in my book, and the same extends to the Hunter of the Damned inquisitor, who gets an annoying shapeshifter-detect and better atk and damage versus lycanthropes. The Clawed Magus can enhance both natural attacks and weapons at once – nice! Simple, but nice! Master of Inner Turmoil Monks may add non-claw-natural attacks to flurries and uses unarmed strike damage for the bite of her animal and hybrid forms – nice! Using hybrid attacks in humanoid form also is interesting -a cool archetype here, even before ki-powered shapechange-healing! The Oracle may opt for the Lunar Prophet archetype, with a moon-powered augury and immunity to lycanthropy and disruptive tricks via touch attacks. Paladins can turn into Holy Beasts, allowing for control over their lycanthropy and spell-list enhancement. The archetype also gets an animal companion at -4 levels and can smite evil lycanthropes with higher efficiency than other smites -solid! The Beast Warden ranger can identify lycanthropes via a check that does not take into account the disguise skills of lycanthropes, only HD. Bad in my book. They may grant favored enemy bonuses to their companions and high-level wardens get a lycanthrope cohort. Bestial infiltrator rogues do not gain evasion, but can grant himself +2 to Dex for 2 x level rounds as a free action…lame? Danger sense and animal companion/scale up to +4/+6 Dex via talents doesn’t help much here to remedy the weak rogue class bereft of one of its best, free defenses – needing to spend a talent on it is not cool. Sorcerors can take the new Lycanthrope bloodline – which obviously nets you scaling bite, DR, increased speed, etc. – still, not a good choice for squishy sorcs. Moonlight summoners can easily make their eidolons get bites and can give them DR and make them inflict lycanthropy. Nice one! The Werelock witch is perhaps the most unique archetype herein – and awesome: They can turn their familiars into an anthropomorphic animal, with more forms, proficiencies etc. all being covered – this makes the witch more of a pet-class and thus results in diminished spell-casting, with 7 hexes/major hexes allowing for more customization. The final archetype would be the Feral Caster, who gets free natural spell at 5th level and automatically adds beast shape spells. As bland as the werelock’s awesome. Editing and formatting, both on a formal and a rules-language level, are very good. Layout adheres to a beautiful two-column full-color standard and the copiuous artworks provided are original and high-quality. The pdf comes fully bookmarked for your convenience. The pdf comes with a second, more printer-friendly version that sports the artworks in b/w. Nice! Mike Welham’s archetypes (with additional content by Sean K. Reynolds, Morgan Boehringer, Jim Wettstein) herein are not bad, not at all – while the unifying theme arguably makes much variation not something you find herein, there is more diversity in here than one would expect at first glance. And indeed, quite a few of the archetypes herein are interesting and tackle relatively complex concepts. However, at the same time, some archetypes are obvious filler material and fall behind significantly behind the more inspired examples of design herein, which is also why this mechanically solid pdf misses highest accolades and only clocks in as a solid, good pdf for a final verdict of 3. 5 stars, rounded up to 4 due to the inspired archetypes for some of the classes in here. 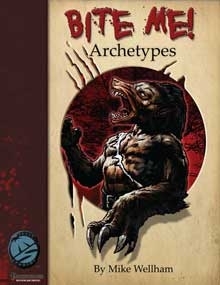 You can get these archetypes here on OBS and here on d20pfsrd.com’s shop! Credit where credit is due: SKR designed the lycanthologist, and Morgan Boehringer (along with co-author Jim Wettstein) designed on the werelock.